Coxhoe Parish Council has released its Grounds Maintenance Contract Tender on 10th January 2019. Find out more about the tender, process and timescales here. The Agenda for the first Parish Council of the new year is now available on-line. 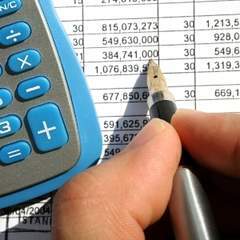 The meeting, which has busy agenda, including the setting of the budget and precept for 2019/2020 takes place at 6.30pm on Monday 7th January 2019 in Quarrington Hill Community Centre. Members of the public are invited to attend. You can access the agenda via this link. December’s Christmas edition of the Coxhoe Chronicle is now available on line. The publication is currently at the printers and will be delivered in the coming weeks to households and businesses within the Parish Boundary by volunteers. 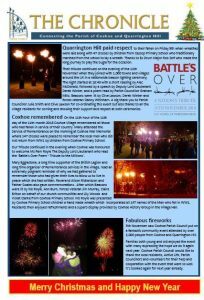 The front page of the Chronicle leads with the recent remembrance and fireworks events and features photographs by Coxhoe residents including Emma Bell and Rod Gary Hall. Download your copy now by clicking on this link. Following a lovely Remembrance Service at Quarrington Hil lon 9th November, Father John Livesey blessed the Quarrington Hill Tommies that were funded by the three Durham County councillors, Cllr Jan Blakey, Cllr MauraMcKeon and Cllr. Stuart Dunn. 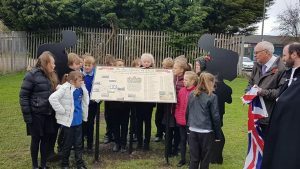 The children then unveiled an interpretation panel listing the servicemen from the village that died in WW1 and a map and photos showing how different the village was 100 years ago. Quarrington Hill paid respect to their fallen on Friday 9th when wreathes were laid along with 47 crosses by children from Cassop Primary School who traditionally marched from the school to lay a wreath. Thanks go to Ex Drum Major Rob Self who made the long journey to play the bugle for the occasion. 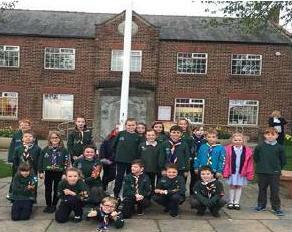 Their tribute continued on the evening of the 11th November when they joined with 1,000 towns and villages around the UK in a nationwide beacon lighting ceremony. The night started at 18:40 with a short reading by Alec McDonald, followed by a speech by Deputy Lord Lieutenant Derek Winter, and a poem read by Parish Councillor Graham Mills. Beacons were lit by Clive Lawson, Derek Winter and forces veteran Danny Whinham. A big thank you to Parish Councillor Julie Smith and Clive Lawson for co-ordinating this event but also thanks to all the village residents for coming and showing their support and respect at both ceremonies. 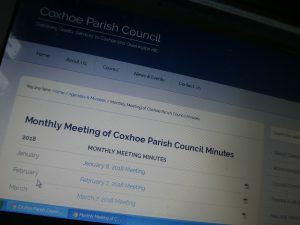 Coxhoe Parish Council is going crackers and is to host a free firework display this year! 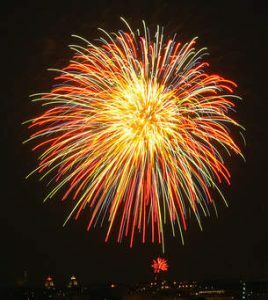 This year, the Parish Council is delighted to offer all residents of the Parish the chance to celebrate Bonfire Night in style with it’s very own Parish Fireworks Display Event, which will be set to music to suit young and old alike. 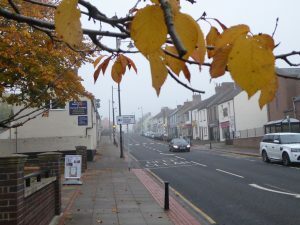 It will take place on bonfire night on Monday 5th November starting at 5.30pm. The display will be held in the outside playing fields adjacent to the Active Life Centre. Entry is entirely free to residents of Coxhoe and Quarrington Hill only. Entry will only allowed to those wearing official event wristbands. We have organised this FREE event to ensure everyone has access to a display and also to support community cohesion. There will be opportunities to purchase things like Fish & Chips, Burgers, Doughnuts/Crepes and drink, glowsticks and there will be fairground rides for small children too. Also check out our scheduled event on our facebook page and let us know whether you are interested in coming. 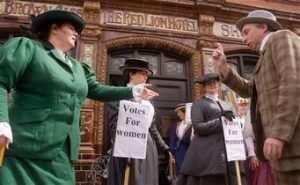 A Suffragette Rally, organised by Coxhoe Local History Group, will take place on Saturday 22nd September between the hours of 11am and 1.00pm. 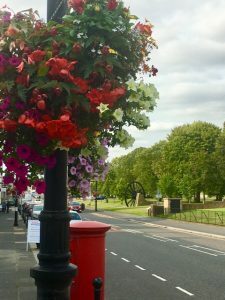 The Rally will consist of a parade from the north of the village to the Village Green where participants will celebrate the contribution women of Coxhoe have made to the culture of the community over the years. women continue to lead and support village organisations such as Kidzone, Skidzone, playgroup, Village Hall, Active Life Centre, Parish Council, schools, churches, chapels etc. Tea and cakes will follow at the Lions Corner Tea House (The Village Hall). Previous to the event there will be craft activities making decorated straw boaters, sashes, bunting, placards (using replica posters etc. Gentlemen who support the cause may attend and assist in the event. Please support the rally, celebrate the role of women in our community, wear the colours, bring your banners and placards and dress in style. For further information contact the History Group. Coxhoe Beavers, Cubs and Scouts have been busy this term, we’ve been out and about in the Village for fact finding walks and photographic scavenger hunts with cameras purchased throughtheir funding award from Aviva Community Funding. Beaver Scouts are the youngest members of the scouting family aged between 6-8 years (meet on a Tuesday evening 5.45-7.00pm), Cub Scouts 8-10.5 years (meet on a Monday evening 6.00-7.15pm), Scouts 10.5-14 (Monday evening 7.30-8.45pm). If you or your child are interested please contact: Paula Prest coxhoebeavers@gmail.com for more information.